As an owner/breeder himself, Dennis has long experience with breaking, training and developing young horses. And while racing horses in his own stable remains a primary focus, he has also been successful preparing young horses to race for trainers on other circuits, as he did for years with some of owner Earle Mack’s yearlings. Another of Dennis’ great strengths is rejuvenating horses that require time to heal from mental and/or physical problems, and his thoughtful, individualized attention has produced impressive results for various owners over many years. 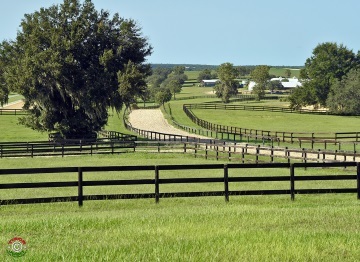 Unlike many trainers in the Ocala area, Dennis and his team provide a level of service with young horses, and those returning from injury, that is more typically associated with top stables on the racetrack. Horses are all hand-walked, and the ratio of horses to grooms is never over-extended. Sets are never rushed, and Dennis often trains until late in the morning to accommodate less experienced, or particularly highly-strung horses, with a quiet track. As Dennis also owns a pristine, undeveloped parcel of land at Oak Ridge, just an easy walk from his barn, horses benefit from the option of training on a lovely, grassy expanse. This provides a welcome mental break from the training track routine, and can be of particular value to unraced, or lightly raced horses that are meant for turf. It is also valuable as a tool to help unwind two-year-olds that have been wound up for sales, as they are able to train in a natural setting, without any of the cues associated with a track. 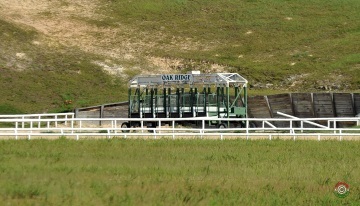 Oak Ridge features a gate for schooling, and also a fine, well-maintained turf course inside of the main track. The latter allows Dennis to confirm surface preferences for unraced, or lightly raced horses, and to polish up proven turf runners that are nearing the races. Dennis’ barn is large, spacious, and very well ventilated. There are also several paddocks just outside of the barn, where horses can benefit from being turned out for varying periods of time. With regard to vet work, Dennis typically takes a conservative approach, and prefers to medicate only when necessary. He maintains excellent relations with several top, Ocala area vets, and also does daily therapeutic work at the barn (e.g. electro-pulse magnetic therapy, etc.) with devices that he owns. For further information, please contact Dennis. The Oak Ridge Training Center confers many advantages to a racing stable as well, including a training turf course, ultra-safe track, turn-out paddocks, and much more.